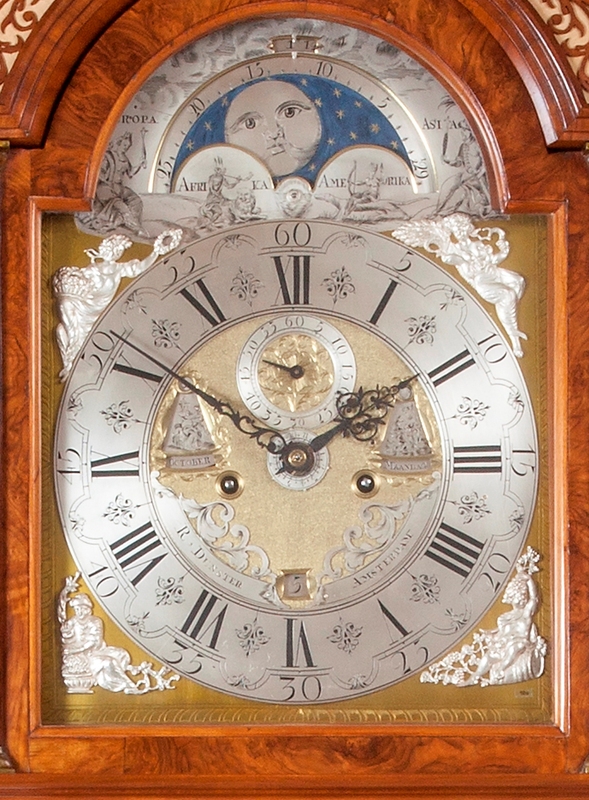 The eight-day weight-driven movement of this longcase clock has going and striking trains, as well as an alarm. The going train has anchor escapement with a seconds pendulum, whilst the Dutch rack striking train indicates both the hours and the half hours fully on two bells differing in pitch. The quarters are indicated by one stroke on the appropriate bell. The weight-driven alarm is set by the alarm disc behind the hands, the alarm time being indicated by the tail of the hour hand. 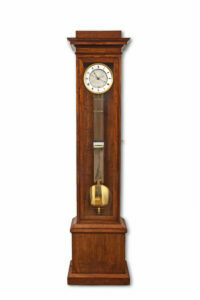 The arched brass dial has a silvered chapter ring with Roman hour, half-hour, Arabic five-minute and minute divisions. The minute ring has arches at the five-minute divisions, which is a typically Dutch feature. The moon phase and moon age are indicated in the arch. In addition, the personifications of the four continents Europe, Africa, America and Asia are engraved along the bottom of the moon aperture. Above the moon aperture is a small aperture indicating the time of high water in Amsterdam. The day and the month are indicated in triangular apertures to the left and right in the matted centre, as well as the corresponding symbols and deities. Above, under the XII is a silvered seconds ring, and below, above the VI a date aperture, flanked by two pierced and engraved silvered brass signature plaques: R. Dunster Amsterdam. The spandrels depict the four seasons. The time is indicated by a fine pair of pierced blued-steel hands. The burl-walnut veneered oak case of the longcase clock is of typical form and has silk-wood line inlays and carved ornaments, notably at the top of the hood and trunk door. The base has buttresses on the corners and rests on ball feet. In the middle of the trunk door is a lenticle with a cast-brass surround depicting Europa on her bull. The hood has plain columns with brass capitals and bases. The top of the hood has pierced silk-backed wooden sound frets all around and is surmounted by three finials: two trumpet-blowing angels and in the middle an Atlas-figure. – H.M. Vehmeyer, Antieke klokken, een familieverzameling, p. 602. – Christies Amsterdam ‘The Decorative Arts Sale’, 22 September 2010, lot 323. Roger Dunster (c. 1695-1747) was a clock and watch maker, both in London and in Amsterdam. In 1722 he became partners with Christopher Clarke in Amsterdam signing their clocks Clarke and Dunster. Clarke (1668-1734) worked together with met Ahasuerus (II) Fromanteel around 1694 under the name of Fromanteel & Clarke. Fromanteel died in 1703 and Clarke continued using the company name until 1722 when Dunster joined the company. When Clarke returned to London in 1730, the partnership came to an end. Roger Dunster continued his business using his own name. In 1744 he bought a house on Vijgendam in Amsterdam. After his death in 1747 master watchmaker Abraham Bruyekeur took over the business.